When it comes to seed or root rots, it is important to have an appropriate diagnosis and not to just stop at disease. Often times, disease is a result of another field stress/issue, so further investigation may be needed. Field history information will be needed as well as the pattern of the poor emergence. Examine the seeds or roots carefully for symptoms such as discoloration or rot and determine the drainage of the field. Is the field tiled or are affected plants in low lying areas that collect water? Soil types may also be an indicator of soil disease issues as heavier soils such as clay can also be prone to holding water. The first soil-borne seedling disease you may have to worry early in the season is pythium. Pythium belongs to the group of fungal like organisms called the oomycetes, which are also known as water molds. Moisture has to be present for zoospores (spores) to infect roots. Increased areas of moisture in the field (3 to 4 hours needed for infection), along with the proper temperatures (50 to 60 degrees F), may provide the perfect conditions for soil pathogens to infect seeds or plants. Early in the growth stage of corn (VE/V2), we are worried about pythium infecting the mesocotyl, as this is the primary root system at this time of growth. Exudates from seed and roots induce fungal spore germination of pythium. If infected with pythium, the root tissue can become dark and watersoaked. This, in turn, will cause that corn plant to decline and possibly die ("damping-off"). At the growth stage V3 to V4, the corn plant’s nodal roots become the plants primary source of water and nutrients. Historically, pythium root rot has been considered a root "nibbler"on corn at more mature growth stages. 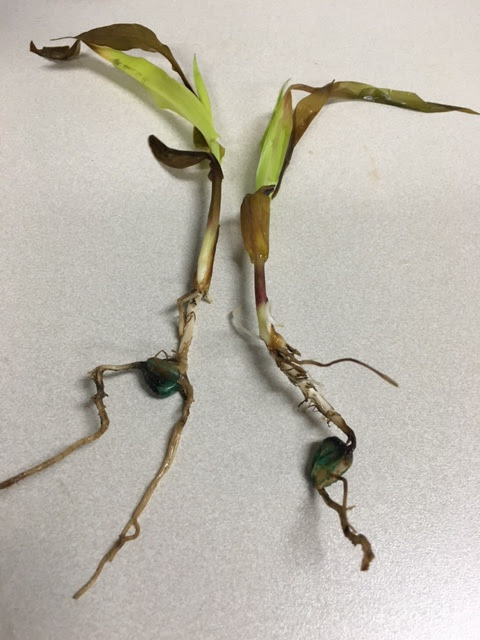 There have been instances where I have examined early stage corn plants with a pythium infected mesocotyl, but as conditions become increasingly warmer or dryer, and less favorable for pythium, nodal roots have appeared to "grow" out of the disease. Although, the corn plant can still be stressed, the change in environment may give the plant a chance to recover. Corn (from Southeast Iowa) suspected to have nitrogen burn and pythium infected the injured root tissue. Fungicide seed treatments on corn are used as a defense against root rots such as pythium. Keep in mind that seed treatments can only provide early season protection. IowaState is finding that certain species of pythium are more prevalent in Southeast Iowa as well that some pythium species are more pathogenic at warmer temperatures (64 to 73 degrees F). IowaState has also concluded "seed treatments that contain a mix of fungicides with activity against Oomycetes (Pythium spp. ), Fusarium spp. and Rhizoctonia are more likely to reduce stand loss from seedling disease."